The X600's size is appealing but the design is hardly ground-breaking. Picture quality is only average in terms of sharpness, colour rendition and tonal range, making it more of a 'me-to' than 'must-have' camera. There's a lot to be said for cameras that can fit in your pocket, with enough space left over for a wallet and a set of car keys. Manufacturers have made huge strides over the last year in the 'slimline' sector of the market and, on the face of it, the BenQ X600 is yet another tiny miracle of photographic science, but it's hardly unique. Not only does it bear a suspiciously striking resemblance to the Pentax Optio S6, but it also has a practically identical specification list, from the shutter speed and sensitivity ranges through the autofocus and metering options, to the image sizes, button layout and beyond. As it turns out, the X600 even features the same 2.5-inch LCD around the back and, for sheer front, the very same Pentax SMC 6.2-18.6 f/2.7-5.2 lens. 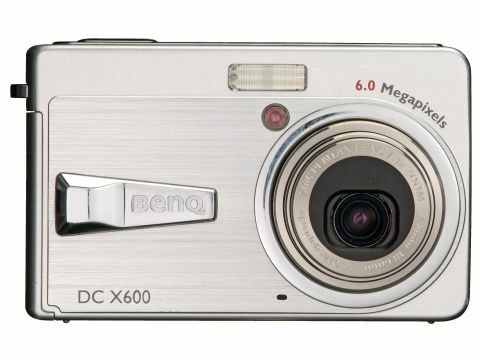 Still, there are plenty of worse compact cameras upon which BenQ could have so blatantly based its design. The metal body of the BenQ X600 simultaneously lends it both a stylish look and a rugged feel. It's not only slightly smaller than the average packet of cigarettes but considerably better for your health, thanks to an amazingly low weight of just 130g, which is guaranteed not to put your back out or strain any muscles. The X600 is easy on the brain as well, with a simple set of buttons and an easy control system that makes fully automatic, point-and-shoot photography a doddle. A press of the on/off button brought our review sample to a full state of readiness in three seconds flat, while the 2.5-inch LCD rear screen that would have been considered huge last year, is now what you'd expect for a camera with no optical viewfinder. In its favour, the LCD is clear and bright, and has a fast refresh rate that's able to keep up with panning quite smoothly, rather than displaying stroboscopic tendencies that try to induce an epileptic fit in the photographer attached to the camera. The down side is that, as with any camera without an optical viewfinder, you have to hold the X600 away from your face while you're using it, which makes camera shake a recurrent danger, especially combined with the camera's poor handling characteristics, which dog most ultra-compact models. Unlike the excellent Konica Minolta Dimage X1, there's no built-in anti-shake technology, so you're left to take your chances. Another unwanted spin-off is that you have to keep the big LCD on all the time the camera is in use, which canes the battery life. We frequently got less than 100 shots from a full charge of the Li-Ion battery. One of the things that reduces camera shake when using the X600 is that, unlike many slimline cameras (especially Nikon models), the X600 is more prepared to up the sensitivity from its lowest, 64 ISO rating when in Auto ISO mode. This is good and bad news, because, although image noise isn't much of a problem at ISO64 or 100, it's quite noticeable at ISO200 and goes from bad to worse towards the ISO800 'candlelight' end of the scale. One thing we particularly liked about the X600 was its generous range of metering and autofocus options. From the clean and simple main menu, you get multi-segment, centre-weighted and spot metering options, while the autofocus sub-menu includes choices for centre-spot, wide and dynamic focusing. The last of these is great for moving targets as it can lock onto an object and cleverly track it as it moves around the frame. Overall image quality was good but nothing special. The Pentax lens is only reasonably sharp and offers a fairly standard 3x optical zoom range, backed up by a typically poor 4x digital zoom enhancement. Colour and contrast were natural, rather than overly vivid, although we tend to like them that way.